The other day I came across an article about St Nicholas of Japan’s approach to Buddhism, and I blogged about it here Christianity and Buddhism | Khanya. St Nicholas acquired his knowledge of Buddhism at first hand, from Buddhist sources. He lived among Buddhists, talked to them and read and translated their scriptures. My knowledge was much more remote. We learned something about it in history classes at school, and then, in our English classes, we were given Kim to read. Kim is fiction. It’s about a 13-year-old boy in Lahore in what is now Pakistan who attaches himself to a Tibetan lama who is searching for a river of healing. Kim is a street kid. He is worldly wise, an expert beggar, and he is impressed that the lama, unlike most holy men of his acquaintance, is not in it for the money. As he sets off with the lama in search of the river, however, he is given a message and a packet by an Afghan horse trader of his acquaintance to deliver to a British colonel. At that time the British ruled India, and the message was an intelligence report. So Kim becomes a teenage spy. After reading St Nicholas’s account of Buddhism, I looked at Kim again, intending to glance quickly at it to see where some of my earliest knowledge of Buddhism had come from. But I read it all the way through, for the fifth time, though the previous time was nearly 30 years ago. Why read a book five times? I’ve read only a few books through five times, and it is because I found something new in them each time I read them, and this time was no exception. One thing that struck me this time was that the last time I had read it, in 1988, the Cold War, which we had thought would last for ever, was about to end. And this time the Cold War is starting up again, and so a lot of things that passed me by in previous readings suddenly stand out. One of the themes of Kim is the clash between British and Russian imperialism. So in a sense it is very up-to-date. The Russophobia in the book reflects the Russophobia we see in the news and in social media every day. One merely has to mention the name of a Western politician as having a less than hostile attitude to Russia for that politician to be discredited, at least in the minds of some people. There is no need to say what the politician has done wrong, or what the Russians have done wrong. He talks to Russians, he’s a bad guy. It’s as simple as that. And so in the book, the bad guys are all those who make friendly overtures to the Russians, and the aim of the British spy network is to detect and neutralise them. As the story goes on Kim himself is more deeply drawn into the spy network, and is educated and trained for the task, though his education is paid for by the old lama. During the school holidays, however, Kim goes back to the lama and joins him in his wanderings, much to the disapproval of the school authorities, who regard the lama as a street beggar. On my first few readings the parts I liked best were Kim’s wanderings with the lama, and the accounts of the different religions, castes and cultures of India, the human variety, and the vivid descriptions of the different characters. But always the lama stood out. from the rest as a centre of tranquility. It looks as though, in writing it, Kipling was himself torn between the worldly concerns, including the concerns of British imperialism, and the thought of the lama, that all this was illusion, and a hindrance to enlightenment. I’ve never been to India, so I’ve no idea how accurate Kipling’s characterisations are, but they are certainly vivid and lifelike. He describes Hindus, Muslims, Christians and Jains, and really just one Buddhist, the lama who is central to the story. One difference between this and my previous readings of the book is that in the previous readings I had very little idea of Orthodox Christian asceticism, Since then I have learnt a bit more about it, and, as I noted in my article on Christianity and Buddhism, there are several external similarities. On rereading Kim the resemblances between the lama and an Orthodox spiritual elder (geron, starets) become even more marked. Both strive for dispassion (apatheia), and the lama repents when his passions get the better of him, as when one of the villains (Russian, of course) tears a drawing he has made of the Wheel of Life, and he reacts with anger. So, perhaps, an Orthodox monk might react if someone desecrated an ikon he had painted, and so might he repent afterwards. Only on the penultimate page of the book do the differences really stand out, and the impersonalism of Buddhism becomes really apparent. The blow was but a shadow upon a shadow. Evil in itself, it met evil in me — anger, rage, and a lust to return evil. These wrought in my blood, woke tumult in my stomach, and dazzled my ears. Had I been passionless, the evil blow would have done only bodily evil — a scar, or a bruise, which is illusion. But my mind was not abstracted, for rushed in straightaway a lust to let the Spiti men kill. In fighting that lust, my soul was torn and wrenched beyond a thousand blows. Apart from the notion that a bodily injury is illusion, I see little there that might not have been said by a Christian spiritual elder. This is a continuation of a synchroblog article Christianity: inclusive or exclusive? In the first two parts of this article I noted that writers on “theology of religion” tended to concentrate on the question whether “salvation” was to be found in non-Christian religions, and to divide views on this into “inclusive”, “exclusive” and “pluralist”. I have tried to show why I believe that this is the wrong question to ask, because no matter what the answer, it does not lead to a “theology of religion”. Some years ago I attended a course on evangelism at the Haggai Institute in Singapore. At that time I was Anglican, and one Sunday I went with a fellow South African Anglican on the course to a service at the Anglican cathedral in Singapore. After the service we went to have coffee at Raffles Hotel, one of the most famous hotels in the city, just to be able to say say we had done so. Then we walked up the road from the hotel to look at the Sultan Mosque, another of the famous sights of the city. On the way our attention was attracted by a lot of noise from a building on the other side of the road — a sound like banging frying pans and blowing hooters. It was a Chinese temple, and we crossed the road to have a look. We asked someone what was happening, and were told that it was the goddess’s birthday. We wandered inside to have a look, in some trepidation, not sure if we were intruding. Two ministers, dressed in orange robes, were chanting something at a table full of fruit, and would occasionally turn round to two women kneeling behind them and wave incense over them. Every now and then a bloke sitting on one side would bang gongs and another would tootle a sort of oboe affair that made a noise like a bicycle hooter. Further in was another room with two benches, on one of which was a pig with an orange in its mouth, and on the other a shaved goat. 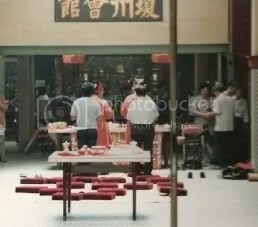 Some people were standing around, others walking about with joss sticks, kneeling down at various places, or bowing and prostrating themselves. On the right was a rack of tablets, — I wondered if they were ancestor tablets — and further to the right a kind of altar with a fire. Geoff remarked that the goddess seemed to be doing rather well for her birthday: apart from the pig and the goat there were plucked ducks (with their heads over their backs), fruit, vegetables and more. As we went out again past the chanting ministers a little girl of about nine was coming in, right past the tooter, following her parents, with her hands over her ears and her face all screwed up. I wish I could have taken a photo of her. The place had an oppressive atmosphere of idolatry, and was very ritualistic. We went on to the Sultan Mosque, a little further up the road. Since it was a Sunday, it was empty, and very quiet, a kind of oasis of peace, with its blue-green carpets, and the noise of the streets seemed far away. We stayed there for a while, enjoying the contrast — the raucous idolatry of the temple, contrasted with the cool iconoclasm of the mosque. Singapore is a very pluralistic place, where several religions can be found coexisting. A week later at an Anglican service we met a man who had been a spirit medium and fortune teller. He had become a Christian, but said he had been plagued by demons. This had persisted until he had had a tattoo of a goddess surgically removed from his back, and he showed us the dressings on his back where the tattoo had been removed. In none of these things did the inclusive-exclusive-pluralist model make much sense. Now I am an Orthodox Christian, and I find that the extremes of the raucous idolatry of the Chinese temple and the cool iconoclasm of the mosque are not for me. Orthodoxy is somewhere in the middle between those two extremes. But that may just be a cultural preference. The man who had switched from being a devotee of the goddess to Christ did, however, have a theology of religion. He believed that having a tattoo of the goddess on his back laid him open to demonic attack (I do not know if his was the same goddess as the one who had had her birthday the previous week). This was not something that Western missionaries had told him to do, in the course of a general attack on Chinese culture. 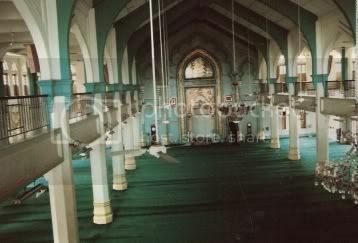 The church be belonged to, an Anglican parish, consisted mainly of people who were the only Christians in their family. The parish priest had been brought up as a Buddhist, but he did not preach against Chinese religion. He simply told people about Jesus Christ. Most members of the congregation had formerly practised Chinese religions, and most of their relations still did. But when they became Christians they developed a theology of religion that interpreted their former beliefs and practices in a new way, from the point of view of their Christian faith. And this theology or religion doesn’t fit very easily into the “inclusive-exclusive-pluralist” model. As a South African, I tended to look at it differently, as an outsider. I had not encountered Chinese religion before, and there are very few books about it in English, so one can’t even read about it. It’s not taught in most religious studies courses in non-Chinese universities (I don’t know about Chinese ones). Most Religious Studies courses seem to teach that the Chinese religions are Taoism, Confucianism and Buddhism, but in fact those are schools of philosophy rather than religion, and to them one could add a fourth, the Thought of Chairman Mao. Among other things, as I noted in part II of this series, a Christian theology of religion should explain why the Bhagavad Gita is there. And these things will all look different when seen from different perspectives. The Christians in Singapore have just come from Chinese religion, and in their perspective it looms very large, because they are still close to it, not just geographically but existentially. A Christian theologian in Chicago, brought up in a Christian environment, will have a different and more distant perspective on it. So in any Christian theology of religion there will be different perspectives, depending on how close one stands to the religion concerned, personally, historically and geographically. There would also be at least as many theologies of religion as there are religions. There might be a Christian theology of Islam, for example. In fact there might be several. I’ve heard some English-speaking Christians, for example, saying “Allah is not God”. I’m still not sure whether that is actually a theology of religion, or simply English-speaking chauvinism, because what it primarily asserts is that those who say it believe that God speaks English and not Arabic, and listens to prayers in English but does not listen to prayers in Arabic. It is but a small step from that to saying that Bog is not God, o Theos is not God, Dieu is not God, uNkulunkulu is not God, Gott is not God, and no doubt God is not God, if God is pronounced with a guttural G, as in Afrikaans and Dutch, instead of the approved English pronunciation, with a hard G. But then what about all those Americans in the soaps who are always saying “Oh my Guard!”? Guard is not God? Or should that be God is not Guard? But if Allah is not God, who do Arabic-speaking Christians worship? As I also noted in Part 2, C.S. Lewis interpreted the Roman Mars and the Greek Ares as Malacandra. That, in a way is a theology of religion, even though Lewis used it in works of fiction. But the very identification of Ares with Mars is a theology of religions, interpreting the ancient Greek and Roman pantheons in terms of each other. And C.S. Lewis was by no means the first to do this, even from a Christian point of view. A Christian work that was very popular in the Middle Ages, the story of Barlaam and Ioasaph, is a Christianized version of a very ancient “spiritual romance” that was composed in India and first written down in an Indian language by Buddhists. So, as I see it, a true Christian “theology of religions” would deal with questions such as “Why does the Bhagavad Gita exist? It would seek to explain other religions in Christians terms But in order to do that, we need first of all to understand them in their own terms. So I think “theologians of religion” like Paul Knitter have got it exactly the wrong way round. We don’t need a theology of religions in order to have authentic dialogue. We need authentic dialogue in order to have a theology of religions. Without such authentic dialogue, we will not have a theology of religion, but a theology of a caricature of religions. Those, like the Chinese Christians in Singapore I referred to, had a dialogue of sorts with Chinese religion, in the sense that they knew it from within before they became Christians. The rest of us are not really qualified, until we have made at least some attempt to understand Chinese religion (see book suggestion below). And just as there might be a Christian theology of Hinduism, the dialogue would enable Hindus to develop a Hindu theology of Christianity, as indeed some have already done. Today is the day of Saints Barlaam and Joasaph (in the Gregorian calendar). As with many Christian saints, stories and legends about other people got attached to them, so that it is sometimes difficult to see what is historical in their lives, and what are transferred legends. Saints Barlaam and Joasaph are interesting in this regard because their story has many features of the life of the Buddha, so that some have said that this is simply a Christianised version of the story of Siddartha Gautama — the prince who left a life of luxury to seek enlightenment.